What are dark circles ? Dark circles can make a beautiful face very ugly. Dark spots are formed under the eyes due to various reasons.Inheritance is considered one of the main reasons for its formation. 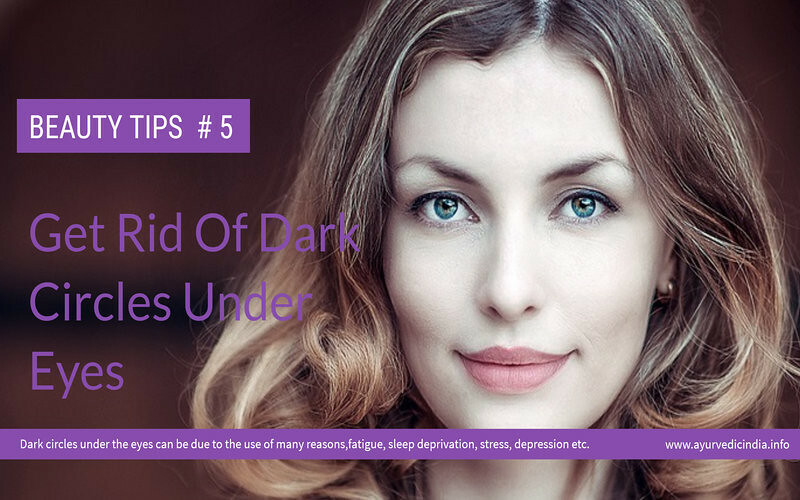 Dark circles are also considered as a sign of unhealthiness. Dark circles under the eyes can be due to the use of many reasons, fatigue, sleep deprivation, stress, depression, lack of nutrients, lack of a balanced diet, hyper pigmentation, sun exposure or excessive drug and medications. Whatever the cause of dark circles, do not look good anyway. They can be easily treated with home remedies right. These remedies include the use of simple ingredients in the kitchen, the application of some herbs, some changes in lifestyle, yoga and exercise. 1.The lack of sufficient sleep:People who do not receive their share of 8 hours of sleep daily develop dark circles under the eyes. 2.Age:Aging is the main factor for the growth of dark circles. As we age, skin becomes dry and dark circles become very important. 3.Nutrient deficiency:Dark circles can also occur due to lack of a healthy diet. It is very important to eat a meal that is high in protein, vitamins and minerals that are very essential for body development. These nutrients should be consumed daily to prevent any health related problems. 4.Stress:Stress is also considered another common cause of dark circles. Dark circles have been developed due to stress, including excessive workload, family problems, money problems and many more. Stress has become very common among young people, which in turn cause dark patches under the eyes. 5.Dehydration:Sometimes, there may be an excessive loss of body water(diarrhea), which could make your skin dry and weak. A healthy diet for dark circles is full of nutrients is the most essential thing in this case. If the body does not get the daily intake of nutrients, can create problems, and perhaps worse in the future. 3) Cereal crops such as oats, barley, wheat and millet. 4) vegetables and Fresh juices of fruits. Breakfast is the most important meal of the day and must be consumed before starting any work. Drinking hot unsweetened non caffeinated (preferably organic or herbal) tea bags. The tea bags should be hot to the extent that it is tolerable. Place in the affected areas, even against the caps. Hold for 18 to 20 minutes to get rid of dark circles. Get plenty of sleep,minimum 6 to 8 hours, making it suitable for your body. Drink about 4 to 5 litre of water throughout the day. Eating fruits and vegetables that are rich in vitamin E for healthy eyes. Apply a paste of herbs nutmeg (Jaiphal) with milk around the eyes and eyelids. Massage the area around the eyes with papaya pulp for five minutes and then let another ten minutes before washing off. Take a teaspoon of tomato juice, half teaspoon lemon juice, a pinch of turmeric powder and a pinch of gramflour. Make a paste and apply on affected area. Keep it for 10 minutes and then wash.
Take two cotton balls. Dip them in the cucumber or potato juice and place them in the eyes. Mix tomato and lemon juice and apply on the dark circles twice a day. Always wear sunglasses when the sun is to protect the eyes from harmful rays. Dip cotton balls in rose water or cold water. Keep on your eyes for 5-10 minutes. Press the stand below the index finger of the hand. It’s good for the eyes and also eliminates dark circles. Practice yoga posture Sarvangasana. Reduces puffiness and dark circles if done every day. Applying grated potato and peeled keep it overnight and wash in morning,practice at least three times a week. Make a thick paste of turmeric, tomato juice, lentils (masoor dal) and lemon juice. Apply the paste around the eyes and let it dry. Then wash with fresh water. Apply frozen cucumber juice around the eyes. This not only reduces dark circles, but the swelling around the eye heals. Some Ayurvedic therapies like Jal Neti is also beneficial for removing dark circles. Jal Neti should be done 5 times a week. Make a paste of turmeric powder and pineapple juice. Apply the dark circles. Mix the crushed almonds with a few drops of milk. Apply the paste around the eyes every morning for ten minutes. Crushed mint leaves and apply. Keep it for about twenty minutes. Great remedies for dark circles! I will use some of these tips for sure.